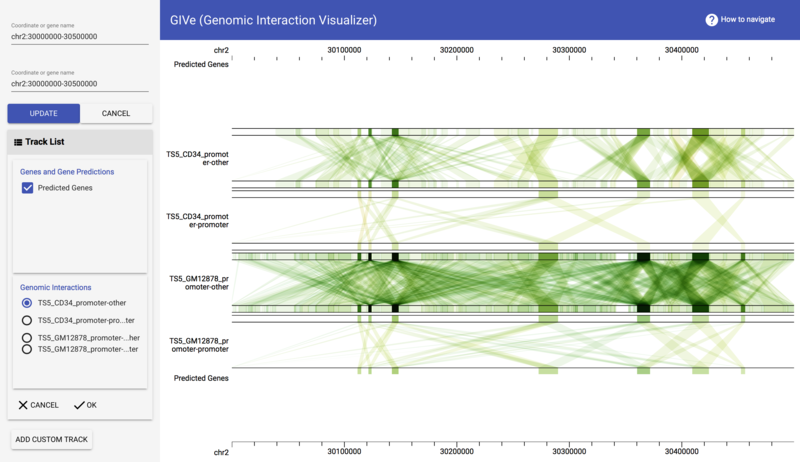 GIVE is an open source programming library that allows anyone without much programming experience to build custom genome browser websites or apps. 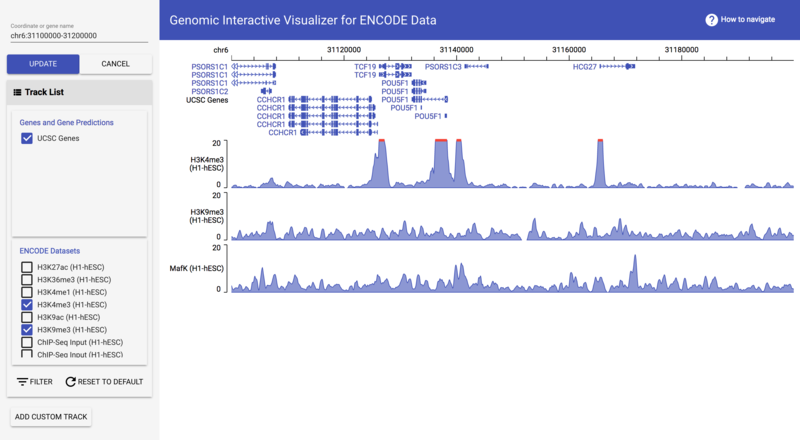 With a few lines of codes, one can set up GIVE service on a local machine, manage custom data and build an interactive genome browser. Besides, we established GIVE Data Hub, a data center providing GIVE service and hosting public/customer data sets. 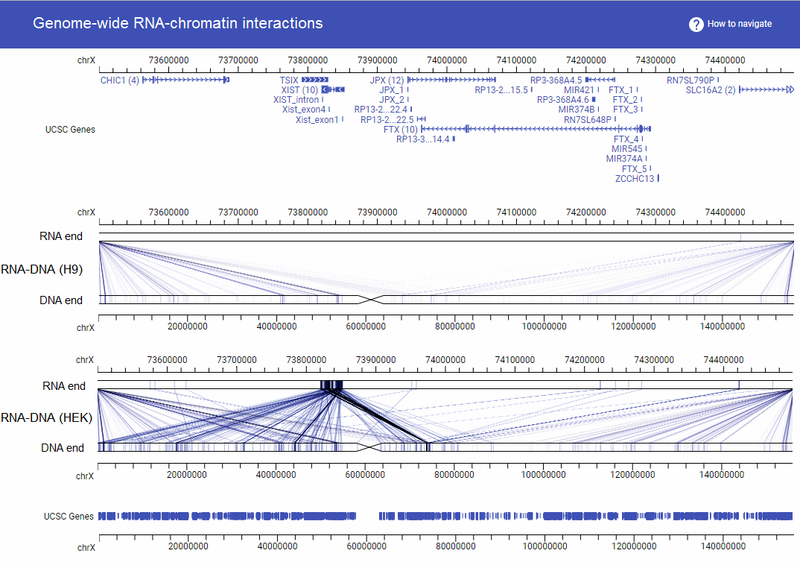 It takes only a few minutes to build a genome browser website using GIVE-Hub. This portable library encapsulates novel data communication and data visualization technologies, including new data structures and new memory management methods that enable efficient data transfer between the data-hosting website and internet browsers. 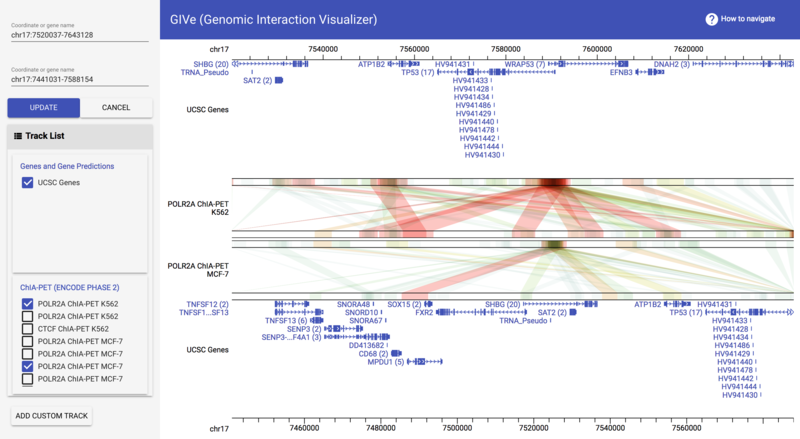 GIVE is the acronym of Genomic Interaction Visualization Engine, although GIVE’s utilities have outgrown its original name. From zero to expert! Step-by-step tutorials with comprehensive examples show you how to elegantly customize a genome browser with GIVE. Technical details for users or developers who want to learn more about how GIVE works. An interactive website for browsing datasets host on public data servers. An interactive feature inside data hub automatically generates HTML files for displaying user chosen datasets, thus relieving the user from doing any programming. The generated HTML file can be saved and shared, or copy-pasted into personal websites. If you want your own data to be included in GIVE Data Hub (the public GIVE instance). Please use Data Submission to GIVE Data Hub form to submit your information to the GIVE team. We will contact you for further details if your data are selected to be included in GIVE Data Hub. Just copy paste the following HTML code to jsfiddle, an online HTML testing website for testing of your own HTML code. 1) Go to jsfiddle, 2) copy paste the following lines to the HTML panel (top left), 3) hit the “run” button. Congratulations! You have built your first genome browser webpage using GIVE Data Hub data source in less than 1 minute. 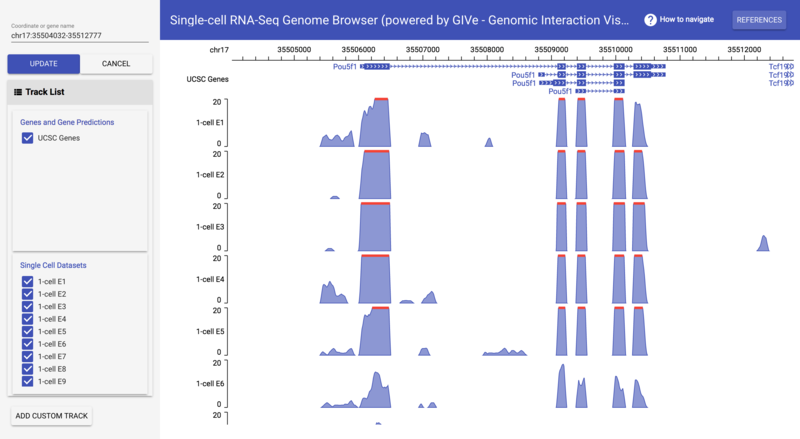 title-text="A 2-minute starter of building a genome browser with GIVE"
So you have enough time to learn some essential tips for customizing your genome browser. Please read the GIVE Tutorial 0: Start from a 2 minutes example. The following GIF animation shows the whole process of the 2 minute tutorial. It’s so easy. How can you use your own data instead of GIVE Data Hub data source? Just learn more from GIVE tutorials! 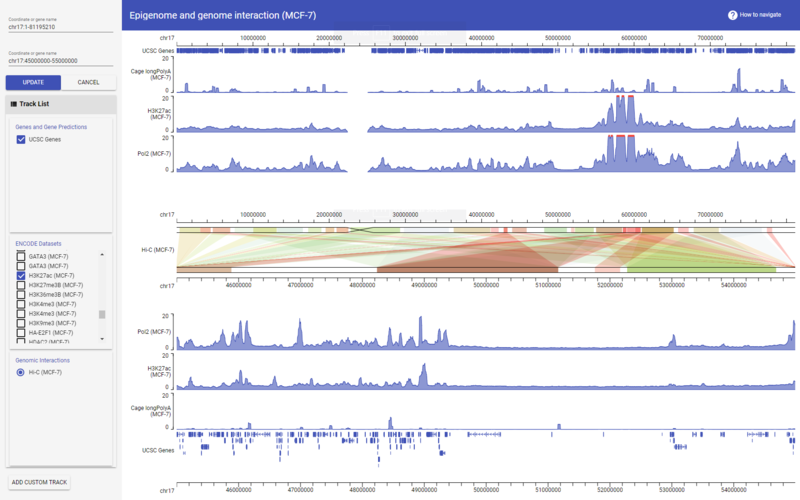 You can set up your own GIVE service and build a powerful genome browser with your own data in less than 2 hours! Citation: Xiaoyi Cao, Zhangming Yan, Qiuyang Wu, Alvin Zheng, Sheng Zhong, GIVE: portable genome browsers for personal websites, Genome Biology, 2018, 19:92. https://doi.org/10.1186/s13059-018-1465-6. © COPYRIGHT 2017 GIVE Authors. Code Licensed under the Apache License 2.0. Documentation licensed under CC BY 3.0. GIVE_homepage is maintained by Zhong-Lab-UCSD. This page was generated by GitHub Pages.